Copyright 1999-2012, all rights reserved. I Collect, Buy Pitch & Bat, Manikin, and Mechanical Animation Games! How to find a game easily in this document: To easily find a particular game, use the CTRL-F function of your browser, and type in part or all of the game's name to search this document. Also check out my Bowling & Shuffle Alley web page and EM Arcade, Fortune Teller, Gun Game and Driving game web page for more information on those games. This document describes coin operated sports games, manikin, and mechanical animation pinball games made (mostly) from World War 2 to present. "Pitch and bat" games are baseball themed (but there are some other non-baseball theme pitch and bat games too). These games are similar to (and often classified as) pinball games. The difference is a small ball is "pitched" to a single large "bat" (flipper), like a pitcher throws a baseball to a batter. The player(s) control the pitch and the flipper bat. Points are scored for target hits (single, double, triple, homerun). Other sports games like coin operated bowling, basketball, boxing and golf games are also covered here. Mechanical animation games in this document include horse racing games with mechanical horses that race, and manikin games (where a small "mini man" mannequin does some mechanical animation). until 1973. Here the bases are loaded. man unit (why are the football players running in circles?!). The running man unit, most often used in coin operated baseball games, is a mechanical animation device which moves small two dimensional running base men from base to base. For every hit, a small metal or cardboard player appears in the baseball diamond, and circles the bases. The running man's movement corresponds to the playfield scoring. Most baseball pitch and bat games without a running man animation unit really aren't collectible. The running man animation is what helped make these games popular. The first baseball running man units were used by Williams from 1947 to 1950. These were VERTICAL running man units, as used on Williams 1947 Box Score and All Stars, 1948 Yanks, 1949 Star Series, and 1950 Lucky Inning. The vertical running man unit was part of the actual backglass score glass. Starting in the fall of 1950, Williams changed to a HORIZONTAL style running man unit. When the horizontal unit was first introduced, the base runners appeared from the TOP of the running man unit, above the baseball field. This was done in 1950 only with the game Double Header (a shuffle alley, and the first game with a horizontal running man unit). Starting in 1951 with Super World Series (a pitch and bat), Williams changed their horizontal running man unit so the running men appeared from underneath the BOTTOM of the baseball field. This made the running man unit much more reliable and less likely to jam (a problem with the 1950 Double Header). Williams used this horizontal running man unit design from 1951 to 1973. A replay, or getting a free game, was considered illegal in some states (New York and Wisconsin for example). The reason was a replay was seen as gambling. Many games gave replays for a high score, or a "match". A match was a random award; if the last digit of your score matched the number drawn by the game, you got a free game. Most post-WW2 pinball games gave some kind of replay, but there were also "novelty" versions of many games that didn't give replays. Until 1960, novelty games only gave additional score points for achieving a game goal. But the additional points didn't net you anything (other than a higher score!). You couldn't win a free game, or extend your current game on early novelty games. Starting in 1960, Gottlieb came up with the idea that giving the player more TIME to play their existing game, instead of a free game, would keep all sides happy. The conservative anti-gambling side could no long complain, as the player wasn't winning a free game. The player was also happy as their game time was extended. The first pinball game that tried this was Gottlieb's 1960 Flipper. This was called an "add a ball" (or AAB) game, because when you achieved a score, you got a free ball. These games were sold mostly in New York and Wisconsin (where replay games were illegal), and some other areas. The idea of extending game time was also applied to Baseball Pitch and Bat games in 1962. Williams introduced Extra Inning, which didn't give replays. Instead, if a player achieved a game goal, they were awarded an extra inning of play. These games are still known as novelty games (opposed to a replay game). Novelty games existed prior to 1962 too; these games didn't give a replay or extra time, but just higher scores! From about 1953 to 1967, Williams usually produced at least two baseball games per year, but with different titles. They were often the same game, but one was a replay and one was a novelty model. By 1968 Williams stayed with one baseball game title per year, and just made it available as replay or novelty. Late 1930s and 1940's: Console Games. The style of the cabinet used on many games during the late 1930s and 1940s was a woodgrain "console" cabinet. These looked largely like jukeboxes, with veneer maple or oak encompassing the cabinet. A very classy style with a very dated antique look. 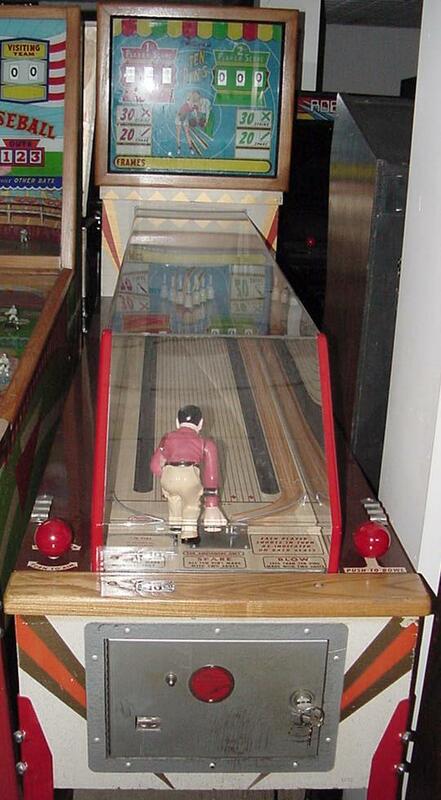 The 1940 Gottlieb Skee-ball-ette (Skeeballette) and 1940 Evans Ski-Ball and Evan's 1939 Ten Strike are classic examples of this console style cabinet. With the 1950s, game cabinets changed largely from a veneered wood cabinet to a painted cabinet. This was less expensive than the hardwood veneer, as stencil patterns were used to paint directly over the non-veneered plywood sides. Natual solid oak wood was still used though for the trim around the edges of the cabinet's scoreglass, lockdown glass molding, and generally anywhere there was glass enclosures. This 1950s "woodrail" era ended in late 1960/1961 when most games changed to stainless steel metal side rails and no oak trim around the scoreglass. Late 1950's: Multiple Pitch Baseball Games. Starting in the late 1950's, many pitch and bat games started to have multiple pitches. This allowed the ball to be pitched fast or slow. A curve or knuckle ball was used on some games too (a magnet under the playfield achieved the curve). This worked really well for two player games where one player pitched and the other batted. Also multiple player sports games became more prevelant. 1960's: Replays versus Extra Innings Baseball Games. In 1962 Williams introduced the pitch and bat game Extra Inning. This game awarded extra innings (extra play time) for high scores (a "novelty" game), instead of winning a game (a "replay" game). From about 1953 to 1967 Williams usually produced two baseballs each year; a replay version and a novelty version with different titles. By 1968, Williams produced just one baseball title per year that was switchable from replay to novelty (early on, may state laws perhibited games to be sold that had any sort of "replay" to them, and companies had to make games that could not be easily converted to replay). Late 1960's: Less Popular Pitch and Bat Games. There were some other ideas tried in the 1960's that weren't very popular. This included the 1965 Midway Play Ball. This gave the player a predetermined number of pitches between 25 and 50 (depending on how the game was set up). Targets on the playfield could give as many as 10 runs. Another unpopular idea tried was Williams 1969 Fast Ball, which has an exceptionally wide playfield. Also Williams 1970 Hit and Run, was another wide body baseball, but had no targets or scoring holes. Instead there were several horseshoe shaped target areas that the ball could roll around. There was also a baseball diamond of lights on the playfield. As a ball rolled around the horseshoe, the lights progressed (like a runner) on the diamond. When the ball finished its horseshoe, the playfield light runner stopped. This game was not popular either. Early 1970's: The Last of the EM Baseball Pitch and Bat Games. Williams started to get their stride back with 1971's Action Baseball (a more conventional pitch and bat, but no running man unit). This game still used the less popular, previous year's "Hit and Run" playfield running man light animation. But then in 1972 and 1973 Williams released Line Drive and Upper Deck. These last two games used electronic sounds for crowd noise and hit sirens, and the conventional mechanical running man unit in the backbox. Unfortunately 1973's Upper Deck was the last electro-mechanical (EM) baseball game offered by Williams. Not until their 1984 electronic Pennant Fever and 1991 Slug Fest would Williams introduce another pitch and bat game. Restoring Willams Pitch and Bat "Men" for the Running Man Unit. The "men" used on the Williams pitch and bat running man unit games from 1951 to 1973 were cardboard. When restoring these games, often the cardboard men in the infield are damaged. I have scans of some of the players. These can be printed with a color printer, and then glued onto the face of the damaged players. These "men" should be printed as follows: The infielders, pitcher, runners, and umpire are all 2 5/16" tall. The batter is 2 3/8" tall. And the catcher is 1 3/4" tall. Left: The Ten Strike (and Ten Pins) bowling manikin. This game is a bowling game, but is the size of a pinball machine! You turn the manikin with a control, and press a button to make the manikin actually bowl the ball. This game was reissued by Williams in 1970 as Mini Bowl. Right: The mechanical animation in Williams 1951 Sea Jockeys. Each pop bumper on the playfield advances it's respective boat. The first boat to the finish line wins. Non-Baseball Pitch & Bats, Manikin, and Mechanical Animation Games. 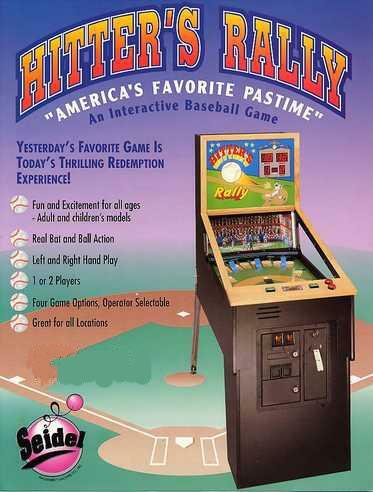 There are plenty of other non-baseball pitch and bat and pinball games that are great. Games like Midway's 1965 Mystery Score, which is a pitch and bat monster themed game. Also games like Midway's 1963 Race Way, Flying Turns, which are race car themed games. These car games have a running man unit too! But instead of baseball men, race cars go around a race track. the 1950s brought with it a slew of "horsey" games by Williams. These games had mechanical animated horses racing through the backglass (or playfield). The first game that had this was Hayburners in 1951. This game had six horses racing through the backglass. The player was assigned one of the horses, and his job was to score on bumpers just for his horse, to advance it first to the finish line. The game ended when any horse got to the finish line, or when all five pinballs drained. In addition, between 1951 and 1952 Williams produced some games using the same mechanism but with other racing themes such as Jalopy (old cars that race), Spark Plugs (horse racing), Sea Jockeys (motor boat racing), and Handicap (horse racing), all using the Hayburners mechanism to move little cardboard figures. Williams took a break until Daffy Derby in 1954, which was a one flipper pinball game with the familar mechanical horse running unit. A different approach to the horse race theme was taken with Turf Champ in 1958. This pinball had the horse running unit in playfield instead of the backbox, and was the only horse race pinball that allowed the player to pick their horse (instead of the game doing it for them). This game had a very large playfield width to accomodate the playfield mounted mechanical horses. it also played badly, because there isn't much playfield area for the ball, and the ball drains very fast (short game time). Again there were no horse race games until Nags in 1960, which was Williams last single player woodrail pinball game, and used the better backbox mechanical horse running unit. This was probably the best of the horse race pinball games, as it used score reel scoring, and had a pop bumper playfield turntable that rotated during game play! Williams last use of the horse running unit was in 1972's Winner, which again used a playfield mounted horse race unit. But instead the horses were *under* the playfield, and the player viewed them through a clear plexiglass window. This saved the playfield for the ball, but unfortunately Winner just didn't play well and hence is not very desirable. There are other cool mechanical animation games that use "manikins" (or "mannequin" if you prefer). There are some baseball manikin games, such as the Rockola 1937 World Series and Evans 1948 Bat-A-Score (with the World Series being the most famous, and the Evan Bat-a-Score being much more unknown, and not nearly as elaborate as the 1937 World Series). But there are plenty of non-baseball manikin games too. Some very unusual examples includes H.C. Evans' Ski-Ball (3/40) and In the Barrel (6/40), Gottlieb's Skee-Ball-ette (1940), Chicago Coin's Midget Skee Alley (1949) and Satomi's Pitch Ball (1972). I was always a fan of skee bowling, but the size of a skee bowler makes owning one impossible. Because of this, the manikin versions are very cool. I would love to find one of these, especially the Gottlieb Skeeballette. One of the coolest manikin games are the Evans' 1939-1953 Ten Strike, Rockalo's 1940-1942 Ten Pins (a licensed clone of Evans' Ten Strike), and Williams 1957 Ten Strike (or Ten Pins, the novelty version). These games are actually bowling games, but are the size of a pinball game. There is a manikin bowler that the player controls. The "little man" actually bowls a steel 1 1/4" pinball down a lane, which hits small bowling pins. This game was reissued by Williams in 1970 as Mini-Bowl. Sega even copied Williams and came out with their own manikin bowler in the 1972 called Pro-Bowler. Another manikin game is Williams' 1964 Mini Golf. This game had a manikin golfer, and a nine hole playfield. The object is to putt the ball into the correct golf holes one to nine (a very linear game, since you always started with hole number one!) There were several other manikin golf games related to Mini Golf. The first was Southland Engineering's Little Pro (1964), which was actually the first manikin golf game (Williams bought the rights from Southland to produce the nearly identical, but more well-known, Mini Golf). There is also the 1965 Williams Hollywood Driving Range. The game play is more like a pitch and bat (less linear) Golf game. Hollywood Driving Range also has traditional score reel scoring (instead of just strokes and holes), and backglass animation. Interestingly, in 1991 Bromley released an updated version of the 1964 Mini Golf called Bromley Little Pro, which was a ticket-spitting redemption game. Bromley added some features to the game like electronic scoring and sound, and also hazzards like ramps and a spinning wind mill. The good thing about the Bromley version is you can continue your game. If you could never get past hole three on Mini Golf, at least with Bromley's Little Pro you could continue your current game (for 25 cents!) until finishing all the holes. A.L. Twins 1963*, Williams, 2/63, same as Major League 1963 (3/63), but the backglass shows two real major league teams. Action Baseball, Williams, 3/71, #400, two players, electronic sound, random varied pitches, lighted playfield that similate base runners. All American Baseball Game, Amusement Machine Corp, made 1929 to 1931, one player, the game World Series 1937 by Rockola was based on and nearly a copy of, manikin playfield players. The "batter up" names included real ball players of the time, such as Babe Ruth. George Miner, the inventer of this game, sold all the rights and tool equipment to Harry Williams in 1931. Miner sold to Williams because nickel play arcade machines (like his baseball) had died at the arcades, being replaced by penny pinball games. Harry Williams was hired by Bally in 1935, and Bally was going to remake the Miner baseball game. Miner was contracted by Bally to make some improvements, but was killed in an airplane crash on October 7, 1935. Then Rockola hired Harry Williams as chief pinball engineer, and along with Harry Williams came the Miner All American Baseball patents and tooling. Rockola then produced the game as "World Series" in 1937. All Star Baseball*, Williams, 2/54, #103, six players, replay version of Major League Baseball* (4/54). All Star Baseball, Chicago Coin, 1962, #297, two players. All Stars, Chicago Coin, 1/68, #354, two player. 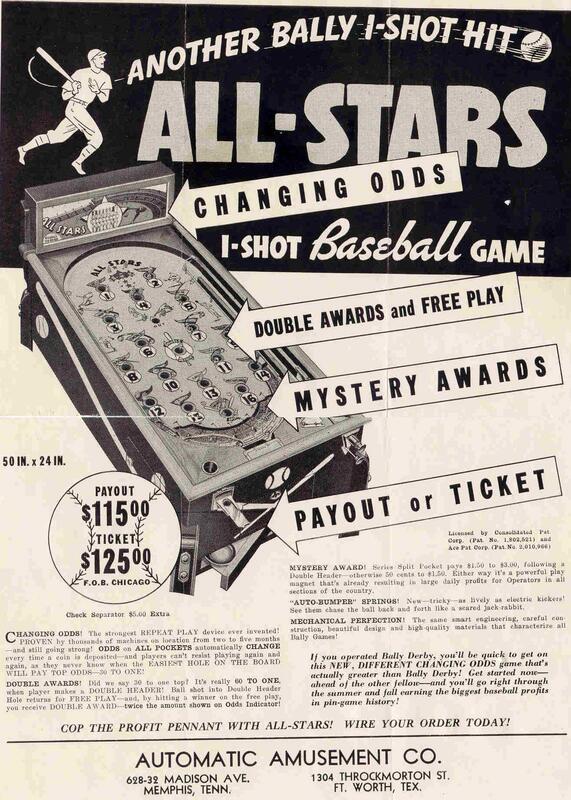 All Stars, Bally, pre-WW2 (exact date unknown), Bally All-Stars is a payout bingo type baseball pinball game. Army and Navy, 12/34, Rockola, one player, based on the famous rivalry of two football military teams, flipper less pinball with very nice playfield animation. Bally Baseball, Bally, 1950s (exact date unknown), a shuffle alley with a unique baseball theme. Bambino, Bally, 6/38, one player. Baseball, Chicago Coin, 10/47, one player flipper pinball. 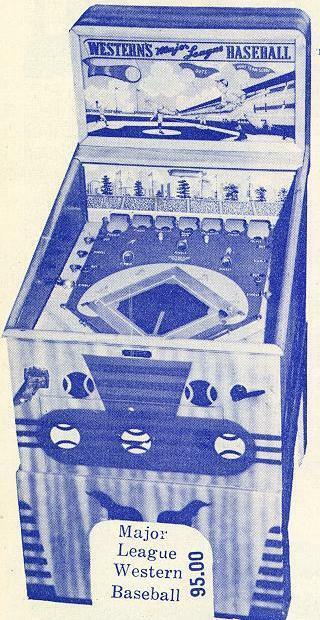 Genco Baseball Electric, Genco, June 1935, an electric pinball baseball with a playfield mounted running man unit using balls. Genco Baseball, Genco, 1942, a rolldown baseball game also known as Genco Play Ball (Genco Playball). Genco Baseball Pool, Genco, 4/56, a pool/billards baseball game. Genco Baseball Shuffle, Genco, 1950s (exact date unknown), a shuffle alley baseball game. Ball Park*, Bally, 2/60, #649, two player, woodrail. Ball Park*, Williams, 2/68, #355, two player, three pitches (fast, curve, knuckle), pointy artwork. Base Hit*, Williams, 4/67, #345, two players, three pitches, ramps for home runs, pointy cabinet art but "realistic" backglass art. Baseball Champ, Chicago Coin, 3/73, #421, two players, three pitches (fast, curve, slider), pitch and bat in a video game style cabinet, EM version of Big League (3/75). Bat-a-Ball, Mike Munves, 1954 (though made for a few years), one player, stand up flip a ball baseball game. Bat-A-Score, Evans, 12/48, one player, manikin players. Batter Up, Chicago Coin, 4/58, one player, uses playfield light animation instead of a steel ball to show ball being pitched and batted, has playfield manikins, uses a mirror to make the playfield seem "deeper". Batting Champ*, Williams, 4/61, #249, one player, same as Deluxe Batting Champ (4/61) but novelty. Batting Practice, Bally, 8/59, rollaway cabinet style, one of three Bally "Swing Shot" games (Bally's marketing term for a pitch and bat). Batting Practice, Irving Kaye, 7/68, newer version of Scientific Batting Practice. Big Bat, Bally Midway, 1984, electronic pitch and bat. Big Hit, Chicago Coin, 7/52, one player, flipper baseball pinball game. Big Inning, Bally, 4/58, two players. Big Inning, Bally, 1959, one player, light animated runners on playfield and backglass, automatic pitching unit (player only controls the bat), unusual cabinet design (almost pre-WW2 styling). Big Inning*, Williams, 3/63, #286, one player, random variable pitch (fast, slow, curve), extra inning for grand slam home run or high score, novelty version of Major League 1963* (3/63), random multiple pitch (fast, slow or curve). Big League, Chicago Coin, 4/65, #317, two players. Big League*, Williams, 3/66, #334, one player, bullseye grand slam awards extra inning, high score awards extra inning, four different pitches (fast, slow, curve, knuckle), novelty version of Pitch and Bat (2/66). Big League, Chicago Coin, 3/75, two players, a pitch and bat in a video game style cabinet, nixey tube scoring, day glow colors, electronic version of Baseball Champ (3/73). Big League Baseball*, Williams, 6/54, one player, triple match. Bonus Baseball*, United, 3/62, one player, scores runs and base scores which add up to a "bonus" score, running man unit with plastic players, rolldown style cabinet. A very basic one player pitch and bat (note the low number of colors used in the backglass artwork). Box Score*, Williams, 11/47, #13, one player, backglass vertical running man unit, roll down model (full cabinet box). Bullseye Baseball, Chicago Coin, 1967, two players, multiple pitches (curve, straight, slider), pop-up ramp. Bulls Eye Big League, Chicago Coin, 5/55, two player, triple deck, similar to United's Star Slugger* (7/55). Bush League, Gottlieb, 1940s (exact date unknown), small pinball-ish style pitch and bat. Champion Baseball, Genco, 6/55, 1.5" plastic balls that fly through the air, manikin players on the playfield. Crazy Ball, Chicago Coin, 7/48, one player flipper pinball. 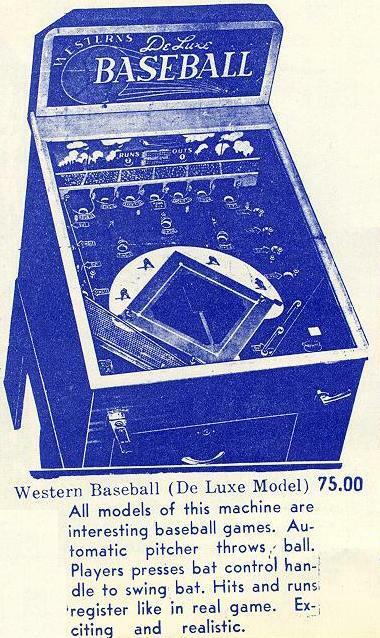 Deluxe Baseball, Western Mfg (Chicago), 1940, similar to Westerns Baseball (1939) and Western Major League (1940). Deluxe Baseball* (1953), Williams, 4/53, #88, one player, short lightbox scoring. Deluxe Baseball* (1954), Williams, 2/54, one player, tall score reel scoring. Deluxe Baseball* (1957) or Deluxe 1957 Baseball, Williams, 2/57, #182, one player, side cutouts in cabinet, scores grand slams and previous hi-score. Deluxe Baseball*, United, 6/59, two players, American league versus the National league. Deluxe Baseball, Midway, 3/62, one player. Deluxe Batting Champ*, Williams, 4/61, #249, one player, super home run pocket that awards 10 replays, same as Batting Champ (4/61) but replay. Deluxe Pinch Hitter*, Williams, 4/59, #217, two players, replay version of Pinch Hitter (4/59). Deluxe Special Baseball*, Williams, 6/53, #93, one player, version of Deluxe Baseball (4/53), short lightbox scoring, Novelty version (no replay) made for New York City. Deluxe World Series*, Williams, 3/52, one player, basically the same game as the prior year's Super World Series* (1951). Deluxe World Series, Chicago Coin, 2/74, #433, two players, baseball pitch and bat in a video game style cabinet, as known as "World Series" (without the "Deluxe"). Double Header*, Williams, 8/50, shuffle alley with running man unit, first Williams game with horizontal running man unit, but slightly different than the unit used from 1951 to 1973 by Williams, as running men appear from the top instead of the bottom horizontal. Double Play*, Williams, 1965, #302 (3/25/65), #326 (engineering update 8/16/65), #327 (novelty), 4/65. One player, completing game title awards replay (carry over feature), hitting seven targets in one games awards extra inning, fast and slow pitch (randomly selected), animated infield "players" that catch the ball then turret around and throw the ball to another base turret for double plays, backglass running man unit, playfield lights to simulate men running to the bases, replay and extra inning. An updated replay version (#326) was released that had an engineering change to the original game. This added a "double play" relay under the playfield, after production started. Also available in novelty version (#327) with no replays. Double Play was probably the most advanced and most animated EM baseball ever produced by Williams. Extra Inning*, Williams, 6/62, #273, one player, woodrail head and metalrail cabinet, first baseball that extended the game with extra innings instead of giving replays, novelty version of World Series 1962 (6/62). Fast Ball, Exhibit Supply Company, late 1940s (exact date unknown), one player, flipper baseball game, woodrail head and body. Fast Ball*, Williams, 4/69, #370, two players, animated backglass with men running the bases in a vertical style running man unit, three pitches (fast, curve, knuckler), two target (infielder and outfielder) "catch" buttons used by defensive player to "field" the ball, pointy artwork, extremely wide body. Fifth Inning*, United, 6/55, four players, running man unit, 5th inning is a cross between a shuffle and ball bowler, puck is returned to the front of the cabinet on a long cloth conveyor belt (opposed to bouncing back to the player like on a shuffle alley), scoring pockets made of soft silent rubber. Flash Baseball, Midway, 4/72, one player, pointy artwork, 8 track tape player, targets that spins. Four Bagger Deluxe*, Williams, 4/56, #156, one player, slugging average, first Williams pitch and bat with a formica playfield. Fun Ball, Midway, 12/66, one player. Grand Slam Baseball*, Williams, 2/64, #294, two players, random pitch (fast or curve), replay model with extra inning, replay version of Tenth Inning* (2/64). Heavy Hitter*, Bally, 2/48, #488, one player. Small pitch and bat with backglass running man unit that uses steel balls. Heavy Hitter, Bally, 2/59, #624, two players, rollaway cabinet style, one of three one of three Bally "Swing Shot" games (Bally's marketing term for a pitch and bat). Hi-Fly Baseball, Genco, 4/56, two players, 1.5" plastic balls instead of steel, cabinet is very deep to allow balls to fly through the air (hence the plastic balls), three decks at back of playfield for scoring. Hit and Run, Williams, 3/70, #382, two players, horseshoe target guides and playfield light animation, extremely wide body. Hits and Runs, Genco, 3/51, one player pinball game with animated (motorized) rotating outfielders. Hitter's Rally*, Seidel, 1990s (exact year unknown), a ticket spitting 1990s version of Williams' 1957 Deluxe Baseball complete with cutout glass playfield sides and a running man unit. Home Run, Chicago Coin, 1954, six players. Home Run, Chicago Coin, 2/72, #405, two players. Home Run Ball Gum, maker unknown, 1950s (exact date unknown), one player. A pitch and bat gum ball machine. Home Run Hitter*, Coin Concepts, 1994, one player, a recent redemption game (ticket spitter). Not a pitch and bat, but a ball "roll down" type game. Uses an old Williams style running man unit. Worlds Fair Jig-Saw, 8/34, Rockola, one player, a cool mechanical animation jigsaw puzzle is revealed as the player scores on Jig Saw. King of Swat*, Williams, 5/55, #129, one player, animated umpire raises arm with runner crosses homeplate, grand slam lights arrows under letters in game title, lighting "G" or "F" awards one replay, previous high score feature, match and high score for replay. Last Williams baseball with a silkscreened playfield (all games after this used a formica playfield). League Leader, Keeney, 4/58, one player, ball fed to pitch unit on a cloth belt (often belt broken). Line Drive*, Williams, 2/72, #410, two players, electronic sound (background crowd noise, explosion when hit is made, siren when homerun made), random varied pitch, bull's eye grand slam ramp, similar to Upper Deck* (2/73). Little League, Midway, 1966, one player. 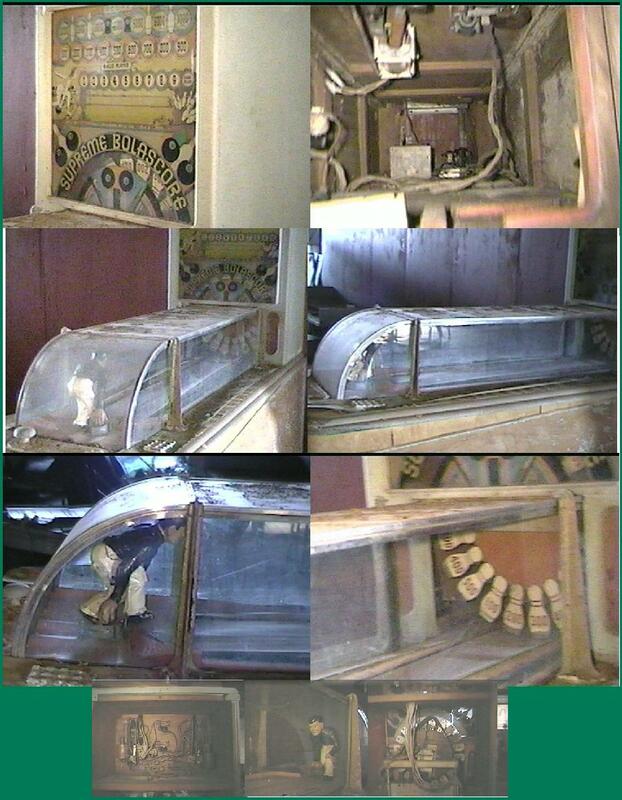 Lucky Inning*, Williams, 8/50, #39, a pinball with a vertical running man unit in the backglass (as used on Star Series*, 1/49), flippers used to keep ball in action longer. Magic Baseball, Shelden Dickson and Steven (Omaha NB), 1966, game uses a "hair drier" to elevate and float the baseball in the strike zone in front of the player. The player could control how much air (power) was fed to the ball, controlling the height of the ball. Then the bat was swung to hit the ball. Major League, Western Mfg (Chicago), 6/40, similar to Westerns Baseball. Major League 1963*, Williams, 3/63, #285, one player, replay model of Big Inning* (3/63), and same as A.L. Twins 1963*, random multiple pitch (fast, slow or curve). Major League Baseball*, Williams, 4/54, six players, novelty play only, double scoring and bonus scoring, novelty version of All Star Baseball* (2/54). Major League Baseball*, United, early 1950s (exact date unknown), playfield has a small running man unit, more of a pinball type game. Mills Softball, Mills, pre-WW2, one player, flipper less pinball baseball game. Mini-Baseball, Chicago Coin, 9/72, countertop game. Official Baseball*, Williams, 2/60, #232, two players, woodrail with players on the playfield and animated umpire and pitcher, plus a running man unit. Also made a one player version of Official Baseball, Williams, 6/60, #237, one player. Official Baseball, Genco, 1934, a pinball game, not a pitch and bat. Pennant Baseball*, Williams, 7/53, #94, one player, version of Deluxe Baseball (4/53), double match or novelty (no replay), short lightbox scoring. Pennant Fever, Williams, 1984, two players, solidstate digital scoring with 190 volt gas discharge displays, three pitches. Pinch Hitter*, Williams, 4/59, #221, two players, multiple pitches (fast and curve), game-to-game carry over feature (each grand slam lights a letter of the word "pinch hitter"; lighting the whole title gave a replay), novelty version of Deluxe Pinch Hitter (4/59). Pinch Hitter*, United, 5/49, a pinball game with a horizontal playfield mounted running man unit. Pitch and Bat*, Williams, 2/66, #332, two players, four different pitches (fast, slow, curve, knuckler), replay version of Big League* (3/66). Pitch Ball, Satomi, 1972, one player, manikin skee bowl game, copy of Chicago Coin's Midget Skee Ball (1949). Pitch'Em & Bat'Em, Scientific, 1948, one player, small square-ish playfield manikin baseball players. Play Ball, Exhibit Supply, 1935, has a playfield mounted running man unit using balls, spits tickets like a redemption game! Play Ball, Evans, 9/41, manikin players. Play Ball slot machine, Mills, 1930s, a baseball slot machine. Play Ball 1942, Genco, 1942, a rolldown game. Play Ball, Gottlieb, 1942, single player flipperless baseball game. Play Ball, Exhibit Supply Company, 1940s (exact date unknown), one player, woodrail head and body, probably made during WWII. Play Ball, Midway, 1965, one player. Play Ball!, Chicago Coin, 1/51, one player, playfield mounted running man unit that uses balls for base runner. Pop Up, Marvel, 1/47, counter top game. Rocket Ball, Chicago Coin, mid-1950s (exact date unknown), one player, a ball popping shuffle alley. Scientific Batting Practice, Scientific, 3/41, one player, manakin players. Scoreboard*, Williams, 4/67, #346, one player, Score Board is the novelty version of Base Hit* (4/67). Short Stop, Exhibit Supply, 1941, one player, pinball game but no flippers. Short Stop*, Williams, 4/58, #203, two players, fast and slow pitches, novelty version of Deluxe Short Stop (4/58), grand slam lites letter in title. Shuffle Slugger, United, 6/50. Based on a shuffle bowler cabinet, the player uses a flipper type button to pitch the ball in the backglass. Then you must slide the puck to operate the bat when the ball is over the plate. Too early or too late, no hit. The scoring lanes (left to right) are single, double, home run, triple, single. Too far left or right is an out. It's designed as a one or two player game with a seven inning total, and a three shot limit instead of outs. The backglass features light animation for base runners. 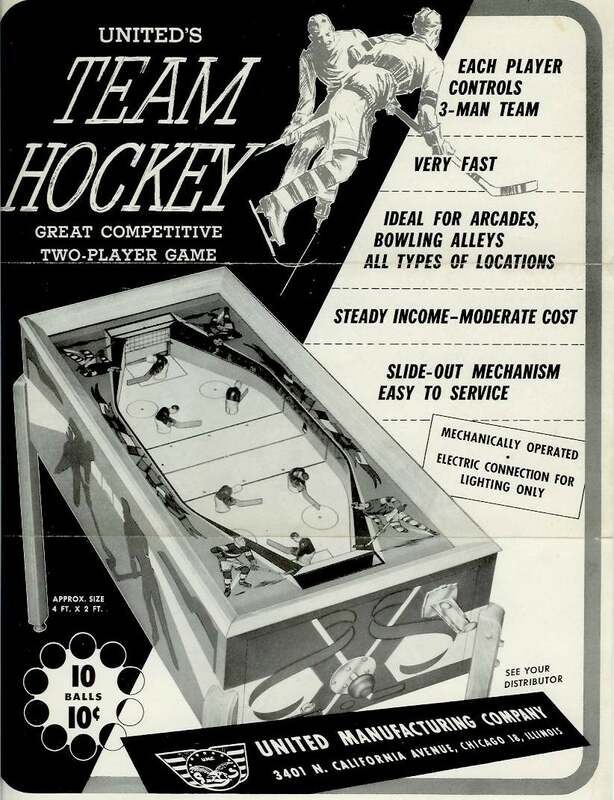 Ski-Ball, Evans, 3/40, one player, manikin ski ball skee-ball game, similar to In the Barrel (Evans 6/40) and Gottlieb's Skee-Ball-Ette (1940). Slugger, Midway, 2/63, one player, target pop up and are shaped like a baseball, a baseball glove or a baseball player. Slug Fest*, Williams, 3/52, #70, one player pinball with running man unit. Slug Fest, Williams, 1991 and 1992, two players, solidstate dot matrix scoring, made in 1991 and then re-run again in 1992, game number 60001 was made in 1991, game number 60011 was made in 1992. Special Deluxe Baseball*, Williams, 2/54, one player, version of Super Pennant Baseball (2/54), "super" backbox with score reel scoring, Novelty version (no replay) made for New York City. Star Baseball*, 6/53, Williams, #89, one player, version of Deluxe Baseball (4/53), double match, short lightbox scoring. Star Series*, Williams, 1/49, #30, one player, backglass style running man unit with players that run the backglass basses. Star Slugger / Star Super Slugger*, United, 4/56, two players, similar to United's Super Slugger (7/55) and Chicago Coin's Bulls Eye Big League (5/55) (but Star Slugger had a running man unit, three bat speeds). Super Slugger, Deluxe Super Slugger*, United, 7/55, two players, running man unit, player controls swing of the bat (weak, medium, hard), has a super home run pocket worth 50 runs, very similar to United's Star Slugger (4/56). Super Home Run, Chicago Coin, 3/54, six players, triple deck. Super Pennant Baseball*, Williams, 2/54, #102, one player, version of Super Pennant Baseball (2/54), double match or novelty (no replay), "super" backbox with score reel scoring. Super Star Baseball*, 2/54, Williams, one player, version of Super Pennant Baseball (2/54), double match or novelty (no replay), "super" backbox with score reel scoring. Super World Series*, Williams, 4/51, #47, first pitch and bat game with the horizontal running man unit. Almost identical to Williams 1952 Deluxe World Series*. Tenth Inning, United, 1949, a smaller game, 10th inning, almost countertop sized. Tenth Inning*, Williams, 2/64, #296, two players, random variable pitch (fast or curve), novelty version of Grand Slam Baseball* (2/64), extra innings awarded for high score. Texas Leaguer, Keeney, 6/40, countertop game or floor model (if it has the original stand). Top Hit, Midway, 3/64, two players, giant LED like number display call "top hit score" (that uses #44 light bulbs). TV Baseball, Chicago Coin, 1966, #334, two players. Upper Deck*, Williams, 2/73, #423, two players, electronic sound (background crowd noise, explosion when hit is made, siren when homerun made), random varied pitch, last EM baseball with running man unit by Williams, similar to Line Drive (2/72) but with added deck of targets. Westerns Baseball, Western, 1939, one player, similar to Western Deluxe Baseball and Western Major League. Worlds Fair Jig-Saw, 8/34, Rockola, one player, a cool mechanical animation jigsaw puzzle is revealed as the player scores. World Series (deluxe) *, Williams, 3/52, one player, first game with conventional horizontal running man unit (with running men appearing from the bottom). World Series, Chicago Coin, 2/74, #433, two players, baseball pitch and bat in a video game style cabinet, as known as "Deluxe World Series". 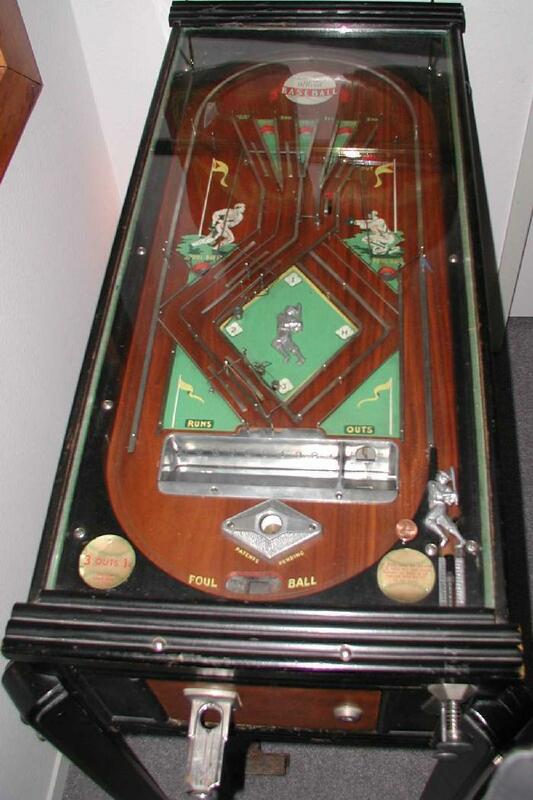 World Series 1934, Rockola, 5/34, a pinball game, not a pitch and bat; uses a standard pinball type cabinet. World Series 1937, Rockola, 1/37, one player, manikin playfield all star players, copy of the 1929 to 1931 Amusement Machine Corp's "All American Baseball". World Series 1962*, Williams, 1/62, #275, one player, scores replays and extra innings, replay version of Extra Inning* (6/62). World Series, Chicago Coin, 2/60, one player, a baseball shuffle alley, light animated backglass runners. Yankee Baseball*, United, 3/59, one player, uses three dimensional plastic men for the running man unit (instead of two dimensional cardboard men like on a Williams game), similar to United's Deluxe Baseball (6/59) but no replay. Yankee Baseball, Chicago Coin, 4/69, #371, two players. Yanks*, Williams, 4/48, #18, one player, vertical running man unit, originally designed as a football theme. * has running man mechanical animation unit. This includes horse racing, hockey, football, baseketball, boxing, golf, sports related animated pinball, non-baseball pitch and bat, sports bowling games, and manikin bowling games. All American Quarterback*, Williams, 10/49, #32, one player pitch and bat, horizontal running man unit with a single football player that runs right and left, football version of Star Series* (1/49) with the same body and a repainted playfield and a different head. All Star Hockey, Chicago Coin, 12/41, one player. Basketball - Midway, Midway, 1964, domed basketball, holes line the concave court and players on opposite ends try to be the first to launch the ball out using a numbered series of push-buttons on their control panel. Basketball - Sega, Sega, 1966. Bolascore (Bowlascore), Supreme, 1940s (exact date unknown, a conversion of Evans Ten Strike. Bowlette, Gottlieb, 3/50, one player, smaller shuffle-type bowler with mini-bowling pins that are electrically knocked down. Slightly longer than a conventional pinball game. The Boxing Machine, maker unknown, date unknown (1980s), a modern version of Mutoscope's K.O. Champ (1955). Carnival, Midway, 1963, one player, a circus themed pitch and bat. Carnival Target, Midway, 1963, two players, a pitch and bat. Champion Hockey, Max Manufacturing Company, late 1940's (exact date unknown), largely a copy of Chicago Coin's Goalee (1946). Criss Cross Hockey, Chicago Coin, 1958, one player, two animated hockey players (the one by the backbox is controlled by the machine) compete to try and score goals against each other. Daffy Derby*, Williams, 6/54, one player pinball, one flipper, two parallel captive ball lanes (one on each side of the playfield), pinball game with mechanical horse running unit. Derby Roll*, United, 5/55, a "roll-down" game where a ball is rolled down the playfield and into the desired hole advancing a mechanical horse in the backbox. Flying Turns*, Midway, 1964, two player pinball, auto racing pinball style game but with a racecar "running man" type unit, similar to Race Way* (9/63) and Winner (12/64), uses real "Dinky Toy" cars (one Ferrari, one Maserati) in the backbox. Goalee, Chicago Coin, 1/46, two player hockey game, manikin (mannequin) goalie hockey players bat the ball (puck) back and forth. Also see Max Manufacturing's Champion Hockey. Gridiron, Williams, 10/69, #376, two players, pitch and bat with a football theme, available novelty or replay, red and blue score dials, foot-shaped plastic over bat (which is usually missing or broken). Handicap*, Williams, 6/52, one player, horse race theme pinball with horse running unit in backbox. Hayburners II*, Williams, 8/68, #360, 2 player, horse race theme pinball with horse running unit in backbox, first pinball game with 3" flippers. Hollywood Driving Range, Williams, 1/65, #308 (replay) and #323 (novelty), one player, golf theme pitch and bat style game with manikin golfer. Backglass animation, similar to Williams' Apollo (1967) pinball game. Uses same manikin golfer as Mini Golf (9/64). In the Barrel, Evans, 6/40, one player, manikin ski ball skee-ball game, similar to Ski-Ball (Evans 3/40) and Gottlieb's Skee-Ball-Ette (1940). Jalopy*, Williams, 8/51, #57, one player pinball, "running car unit" animated backglass with cars that race. Exactly the same game as Williams' 1951 Hayburners, but with a car race theme. JMCO Vending Machine, EE Junior Manufacturing, date unknown, a gumball basketball game. Jungle, Williams, 7/60, #239, one player pinball, animated jungle animals are knocked down (shot) as rollovers are hit on the playfield. Unique "space age" cabinet design that Williams used just under a year. Also has a red animated animal score reel in the center of the playfield with pictures of the animals that are knocked down by hitting the center target. Knock Out Fighters, National Novelty, 1928, K. O. Fighters is a manikin boxing game. Little Pro, Bromley, 1991, a 9 hole par 3 golf game. A modern version of Southland Engineering's Little Pro (3/64) and Williams' Mini Golf (9/64). Fully electronic, and has golf obsticles like ramps and a moving windmill. Mini-Bowl, Williams, 8/70, #379, manikin bowler, reissue of Ten Strike and Ten Pins (12/57). Mini Golf, Williams, 9/64, #301 (replay) & #309 (novelty), two players, 9 hole par 3 manikin golf game. Must shoot holes one to nine, in order, with a limited number of shots. The rights for this game were bought from Southland Engineering. Hence Mini Golf is very similar to their Little Pro (1964) game. Score reels only show strokes taken and hole number. A more pitch and bat style of this game was released in 1965 with Williams' Hollywood Driving Range game. Nags*, Williams, 4/60, one player, woodrail pinball game with mechanical horse running unit and a pop bumper playfield turntable. Old Time Basketball, 1976, Exidy, a failed attempt to copy the classic 1947 Chicago Coin Basketball Champ. Only about 1000 of these were made, as they did not sell well (they had to compete with videos and pinballs). Par Golf, Super Par Golf, Chicago Coin, 1965, one player, backbox animation. Has a manikin golfer next to the conventional "pitch and bat" style bat. Unfortunately the manikin is often broken (from pitched balls). Replay version of Par Golf. Play Hockey, International Mutoscope, 1940s (exact date unknown). Pro Basketball, Chicago Coin, 1961, one player manikin basketball game. Pro Block a Shot basketball, Briarwood, 1976, two players. Pro-Bowler, Sega, 1972, two players, mechanically animated manikin bowling game. Very similar to Williams' Mini Bowl (8/70). Five foot playfield length. Quarterback, Genco, 1957, one player, 1.5" plastic balls that are kicked through the air. Race Way*, Midway, 9/63, two player pinball, auto racing pinball style game but with a racecar "running man" type unit, similar to Flying Turns* (1964) and Winner* (12/64), uses real "Dinky Toy" cars (one Ferrari, one Maserati) in the backbox. 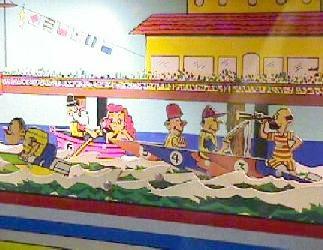 Sea Jockeys*, Williams, 11/51, #60, one player, motorboat racing pinball game with running motorboat animation unit. Shuffle Slugger, United, circa 1952 (exact date unknown), two player. A shuffle alley with a baseball theme. Silver Gloves, Mutoscope, 1948, two players, manikin boxers fight each other (boxing), one control moves the fighter forward and back, the other control swings the fighter's arm, when a fighter is knocked out by a hit to the chin, the manikin actually falls down for the count, three knock outs and the other player wins. Slapshot Hockey, Chicago Coin, 1969, Slap Shot is a two player hockey game. Spark Plugs*, Williams, 9/51, one player, pinball game with mechanical horse running unit. Stanley Cup, Irving Kaye, 1960s (exact date unknown), a copy of earlier hockey games like CCM Goalie and others. Steeple Chase, United, 1950s (exact date unknown), animated horses in backbox that move based on holes scored. Looks like a rolldown cabinet pinball, but there are no flippers. Supreme Bolascore, Supreme Enterprises, 1942, one player, a revamp of Evan's Ten Strike manikin bowler, uses a giant "roto-target" instead of individual bowling pins. Targets, Bally, 9/59, #640, two players, rifle theme pitch and bat, rollaway cabinet style, one of three Bally "Swing Shot" games (Bally's marketing term for a pitch and bat). Target Gallery, Midway, 1962, one player, animal themed (rabbit and squirrel) pitch and bat. Target Gallery, Midway, 1962, two player, animal themed (cat and mouse) pitch and bat. Team Hockey, United, 1950s (exact date unknown). Ten Strike, Evans, 9/39 to 1/53, made in several different variations, mechanical manikin bowling game. Rockola made a licensed copy called Ten Pins from 1940 to 1941. Evans went out of business in 1955, and the manikin bowler idea was bought by Williams and used in their "Ten Strike" and "Ten Pins". Ten Strike, Williams, 12/57, two players, mechanically animated manikin bowling game, match feature, replay version of Ten Pins (12/57), reissued in 1970 as Mini Bowl. Ten Pins, Rockola, 1/40 to 1941, manikin bowler, a licensed copy of Evans' Ten Strike. Ten Pins, Williams, 12/57, two players, mechanically animated manikin bowling game, no match (novelty), reissued in 1970 as Mini Bowl. Touchdown*, Williams, 1965, #307, a pitch and bat with a football theme. Has a football running man unit. Instead of "outs" (like baseball), "fumbles" are used (three fumbles end the game). If a 25 yard target is hit, a running man unit football player "runs" (to first base). One hundred yards (getting a running man unit player to run "home") scores one point (a touchdown) on the score reels. If all targets are hit (including two fumbles!) across the back of the playfield (there is a light on the backglass corresponding to each target), then an overtime period is awarded (three additional fumbles). Also a touchdown pocket with a bullseye target, a carry-over feature (spell T-O-U-C-H-D-O-W-N) for multiple replays, and a magnet under the playfield to randomly vary the pitching. Turf Champ*, Williams, 7/58, #207, one player, horse race theme pinball with horse running unit in playfield, only horse race pinball that allows the player to pick their horse (instead of the game doing it for you), very large playfield width. Twin Hockey, Chicago Coin, early to mid 1950s (exact date unknown), two players. Winner*, Midway, 12/64, two player pitch & bat, racecar "running man" type unit, similar to Race Way* (9/63) and Flying Turns* (1964) pinball games, but Winner is a pitch & bat. Uses real "Dinky Toy" cars (one Ferrari, one Maserati) in the backbox. Winner*, Williams, 5/72, #388, two players, horse race theme pinball with horse running unit below playfield. Starting in 1947, Williams usually produced one new baseball game every year until about 1973. Their yearly baseball was usually introduced early in the year, in the Febuary to May time-frame. They also made specific versions of that yearly offering for unique areas of the country. For example, a non-replay (novelty) version for New York and Wisconsin (where winning a replay was considered illegal). Horse Shoes, Exhibit Supply, 1935, a dice game, but does not payout, more of a trade stimulator. But still a neat game, just not a pay out model. Baseball, Genco, 6/35, an electric pinball baseball with a playfield mounted running man unit using balls. Chester Pollard Baseball, Chester Pollard, 1920s (exact date unknown), two player, not coin operated. Baseball, Genco, 1942, a rolldown game. Westerns Baseball, Western, 1939, one player. Bat-A-Score, Evans, 12/48, 1 player, manikin players. Star Series*, Williams, 1/49, #30, one player, backglass style vertical running man unit with players that run the backglass basses. All American Quarterback*, Williams, 10/49, #32, one player pinball, horizontal running man unit with a single football player that runs right and left, football version of Star Series* (1/49) with the same body and a repainted playfield and a different head. Tenth Inning, United, 1949, a smaller game, almost countertop sized. Play Ball!, Chicago Coin, 1/51, one player, playfield mounted turntable running man unit that uses balls for base runner. Deluxe Baseball*, Williams, 4/53, #88, one player, short lightbox scoring. Deluxe Special Baseball*, Williams, 12/53, #93, one player, version of Deluxe Baseball (4/53), short lightbox scoring, Novelty version (no replay) made for New York. Super Pennant Baseball*, Williams, 2/54, #102, one player, double match or novelty, "super" backbox with score reel scoring. Super Star Baseball*, Willams, 2/54, one player, version of Super Pennant Baseball (2/54), double match or novelty, "super" backbox with score reel scoring. Two Player Basketball, Genco, 3/54, two players, player controlled manikin basketball players compete against each other, game comes three ways (novelty, deluxe, super). Daffy Derby*, Williams, 6/54, one player, one flipper, two parallel captive ball lanes (one on each side of the playfield), pinball game with mechanical horse running unit. Bulls Eye Big League, Chicago Coin, 5/55, two player, triple deck, similar to United's Star Slugger (7/55). Hi-Fly Baseball, Genco, 4/56, two players, 1.5" plastic balls instead of steel, the High Fly Baseball cabinet is very deep to allow balls to fly through the air (hence the plastic balls), Hi Fly Baseball has three decks at back of playfield for scoring. Star Slugger / Star Super Slugger*, United, 4/56, two players, similar to United's Super Slugger (7/55) and Chicago Coin's Bulls Eye Big League (5/55) (but Star Slugger had a running man unit and two pitches and three bat speeds). Deluxe 1957 Baseball*, Williams, 2/57, #182, one player, side cutouts in cabinet, scores grand slams and previous hi-score. Big Inning, Bally, 4/58, two players. Note there was also another Bally Big Inning game made in 1959 (one player). Big Inning, Bally, 1959, one player, light animated runners on playfield and backglass, automatic pitching unit (player only controls the bat), unusual cabinet design (almost pre-WW2 styling). Note there was also another Bally Big Inning game made in 1958 (two players). Jungle, Williams, 7/60, #239, one player pinball, unique "space age" cabinet design that Williams used just under a year. Animated jungle animals are knocked down as rollovers are hit on the playfield. Also has a red animated animal score reel in the center of the playfield with pictures of the animals that are knocked down by hitting the center target. Road Racer, Williams, 3/62, #264, one player driving game using a small matchbox style car. Carnival Target, Midway, 1963, two players. Grand Slam Baseball*, Williams, 2/64, #294, two players, random variable pitch (fast or curve), replay model with extra inning, replay version of Tenth Inning* (2/64). Mini Golf, Williams, 9/64, #301 (replay) & #309 (novelty), two players, a 9 hole par 3 manikin golf game. Must shoot holes one to nine, in order, with a limited number of shots. The rights for this game were bought from Southland Engineering. Hence Mini Golf is very similar to their Little Pro (1964) game. Score reels only show strokes taken and hole number. A more pitch and bat style of this game was released in 1965 with Williams' Hollywood Driving Range game. Par Golf or Super Par Golf, Chicago Coin, 1965, one player, backbox animation. Has a manikin golfer next to the conventional "pitch and bat" style bat. Unfortunately the manikin is often broken (from pitched balls). Super Par Golf is the replay version of Par Golf. Double Play*, Williams, 4/65, #302 and #326 (engineering update) and #327 (novelty), one player, completing game title awards replay (carry over feature), hitting seven targets in one games awards extra inning, fast and slow pitch (randomly selected), animated infield "players" that catch the ball then turret around and throw the ball to another base turret for double and even triple plays, backglass running man unit, playfield lights to simulate men running to the bases, replay and extra inning. An updated replay version (#326) was released that had an engineering change to the original game. This added a "double play" relay under the playfield, sometime after production started. Also available in novelty version (#327) with no replays. Double Play was probably the most advanced and most animated EM baseball ever produced by Williams. Unfortunately it was also a mechanical nightmare, and was difficult to keep running on location. Score Board*, Williams, 4/67, #346, one player, Scoreboard is the novelty version of Base Hit* (4/67). Hayburners II*, Williams, 8/68, #360, two player, horse race theme with horse running unit in backbox, first pinball game with 3" flippers. Mini Bowl, Williams, 8/70, #379, manikin bowler, reissue of Ten Strike and Ten Pins (12/57). Pro Bowler, Sega, 1972, two players, mechanically animated manikin bowling game. Very similar to Williams' Mini Bowl (8/70). Five foot playfield length. Ten Strike Classic, Benchmark Games, 2003, two player, a reissue of the original 1957 Williams Ten Strike game.